At the left hand side of the church facing the altar is the baptistery (from Wikipedia: "In Christian architecture the baptistry or baptistery is the separate centrally-planned structure surrounding the baptismal font. The baptistry may be incorporated within the body of a church or cathedral and be provided with an altar as a chapel.") composed of a half-drum surmounted by a semi-dome. This was the first part of the church’s interior to be decorated and clearly no expense was spared in the creation of what is undoubtedly the most precious unit in the church according to the Saint Ignatius Loyola website. 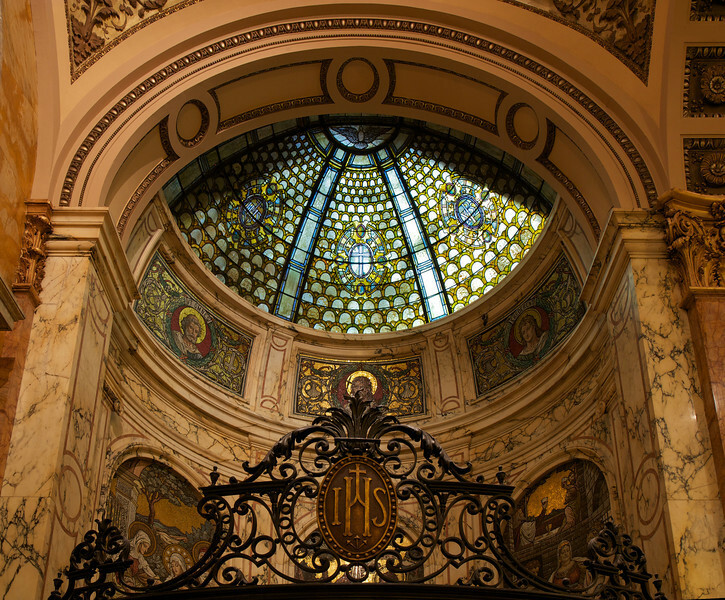 Caryl Colement of the Ecclesiastical Department of the Tiffany Glass and Decorating Company was designed and executed the baptistry’s altar. Like the curved walls surrounding it, is of Pavonazzo marble and is inlaid with mosaics.